Klayman: Time for Fox News' Chris Wallace to Join Don Lemon, Chris Cuomo, and Anderson Cooper at CNN! 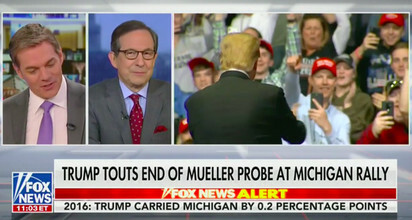 Fox News' Chris Wallace sets record straight on Russia probe: "This is going to drive some of our viewers nuts"
Fox News host Chris Wallace fact-checked a disputed element of the special counsel Robert Mueller's Russia investigation yesterday, noting that his setting the record straight would "drive some of" the network's viewers "nuts." During an America's Newsroom segment on Friday morning, Wallace agreed that Donald Trump "got a complete clean bill of health when it came to collusion and a kind of mixed bill of health when it came to obstruction" and noted that, when the report comes out that "Democrats are going to go after him again."